Find out what you need to know about how to travel safely in the car with your pets. When it comes to the safety of your pets, it’s important that you take care to protect them. Before you set out on your road trip, ensure that you’re well prepared to travel safely with these tips for traveling with pets. Before setting off on your adventure, it’s important that you pack a bag for your pet. Ensure that you pack the essentials like food and water, medicines, a travel bowl, leash, and blanket. Additionally, you can pack a few toys to keep your pet entertained. In the event of an accident, your pet can get seriously injured in the car. 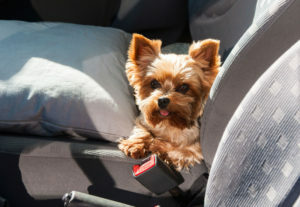 Ensure that you help to keep your pets safe by investing in a pet seatbelt. That way they’re better protected in the event of an accident. Your pet needs a break from the car every so often. When on a road trip, ensure that you stop every hour or two to stretch your legs and your pet’s legs. Plus, it allows your pet to take a bathroom and water break. Your car heats up quickly, especially in the summer. Never leave your pet unattended in a vehicle, even with the windows rolled down. Always bring your pet with you when you leave your vehicle to keep them as safe as can be. When it comes to your road trip, ensure that you’re prepared to travel with your animals. For added protection on the road, invest in the right auto insurance. Contact the professionals at Robert J. Los Insurance Agency to find you the right insurance plan. Located in Hamburg, New York, we serve all your personal and commercial insurance needs.